William Martin "Billy" Joel (born May 9, 1949) is an American musician and pianist, singer-songwriter, and classical composer. Since releasing his first hit song, "Piano Man," in 1973, Joel has become the sixth best-selling recording artist and the third best-selling solo artist in the United States, according to the RIAA. 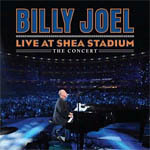 Billy Joel: Live at Shea Stadium is a music compilation of songs performed by American singer/songwriter Billy Joel during a two concerts at Shea Stadium in New York City on July 16 & 18, 2008. It was released on March 8, 2011. The two concerts were the last performed at Shea Stadium before it was torn down to make way for Citi Field. It features guest appearances by Tony Bennett, Garth Brooks, John Mayer, and Paul McCartney. Released as 2CD/DVD package. In addition to the 2CD, the DVD of the concert offers three extra performances: "Walk This Way" with Steven Tyler, "My Generation" with Roger Daltrey, and "Pink Houses" with John Mellencamp.